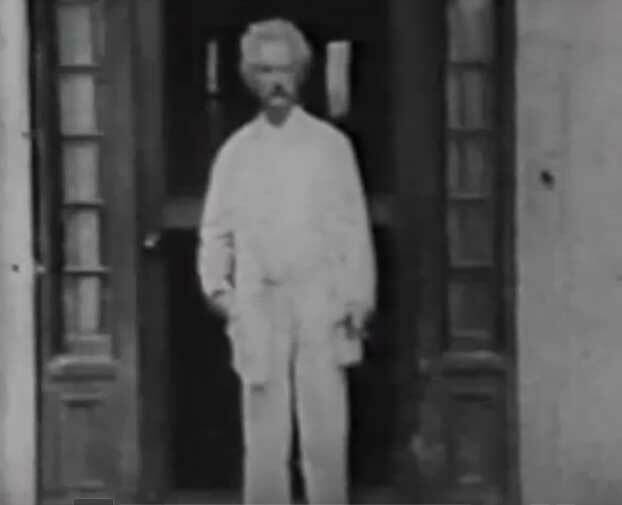 Shot by Thomas Edison in 1909, this digital restoration of a short film is most likely the only moving image of Twain in existence. Watch him strolling around Stormfield, his house in Redding, Connecticut—signature white suit draped loosely around his frame, signature cigar puffing white smoke between his fingers. After Twain’s leisurely walk along the house’s façade, we see him with his daughters, Clara and Jean, seated indoors. This entry was posted on July 12, 2015 by Vox Populi in Art and Cinema, Opinion Leaders and tagged Edison film, Mark Twain, Mark Twain at Stormfield, Mark Twain only known film, Opinion Leaders, Thomas Edison, Video.